Enjoy a relaxing stay at our beautiful and well equipped 2 bedroom and 2 bathroom Village at Riverstone condo in gorgeous Coeur d'Alene Idaho. Within walking distance to the lake/river trail system, fine dining, cafes, unique shopping and close to the downtown resort area. This is a private end unit that makes for very quiet mornings to sleep in and enjoy your vacation. The remodeled kitchen includes high end appliances and is very well equipped if you decide to stay in and enjoy a meal at home. The condo has a full sized front loading washer and dryer for your convenience. The two bedrooms have pillow top queen sized beds and cozy bedding. Both bathrooms are full size and stocked well. You also have access to the community’s shared patio that has gas fired BBQs and plenty of seating for additional guests. The unit includes two full sized parking spaces in the underground secure garage. Don’t forget to enjoy the sunset from your spacious private balcony. CDA City Permit #52967. We both grew up in the area and know it very well. We've always loved the Coeur d' Alene area and all of the year-round outdoor activities that it offers. Located in the heart of Coeur d'Alene. 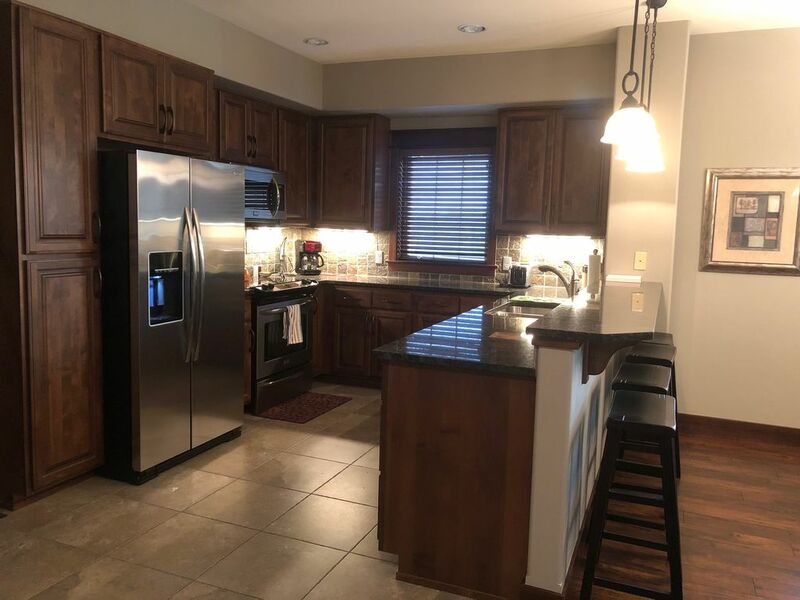 Within walking distance to the lake/river trail system, fine dining, cafes, unique shopping and only a couple miles from the downtown resort area. Located in the Village at Riverstone. The village includes a movie theater, numerous cafes and restaurants, fine dining and connects to a biking/walking trail system along the beautiful Spokane River. This condo is amazing!! So spacious beautiful layout perfect location so close to everything. Lisa was amazing in everything we did and suggested. Definitely will be back!!! Great place to stay. Spacious, clean, all kitchen amenities needed, great quality products and furnishings. Best of all safe and quiet with dry covered reserved parking. Walking distance to restaurants. The condo suited all our needs. The location was perfect for our visit with family in Post Falls and to downtown/CDA lake area. Lisa was a great host and was very responsive to any questions we had. I appreciated that she left a binder with info we needed for the TV and the unit, in general. Very helpful. There were little shopping carts and a luggage cart in the parking garage by the elevators which came in very handy moving items in and out. We had a nice view of the mountains and Riverstone and CDA lake was decorated for the holidays, which was a bonus. We would stay again. Perfect stay in a perfect location! Excellent!! This condo was perfect for our stay. Beautifully decorated, well kept and fully equipped. Loved the comfort and the balcony space was perfect for evening relaxing. We highly recommend this rental and we will be back soon! Must stay!